Up until now we have been able to do a lot of different exercises in VR. All kinds of different movement can be facilitated by VR while using visual, audio and kinestetic cues. This is all well and good but what happens when our patients progress to a level beyond resistance free training? Do we go back to the old way of training or is there something we can do in VR. I know, i know I’m not very good at building suspense, since i already gave the answer away in the title. (Note to self. Build mystery and don’t ruin it with simple mistakes). So why do physical therapists need this? VR is great for doing rehabilitation in the early stages after injury or operation. This is where there is no need for resistance in the training. For stroke patients doing ADL (activities of daily living) its great because we can simulate the environments that they will be heading back to, we can do mirror therapy and a whole lot more. But as i stated earlier, what happens when the patients progress past this level? The vive tracker is a peripheral from HTC that lets you ad an additional tracking point to your VR experience. And what does that mean to the average joe? It means that you can bring any household object with you into VR and have it show up in your virtual environment. Some things it has seen use for is to bring for example guns with you into VR. So you can get the feel of a real weapons while shooting stuff. But a physical therapist dosent need a gun. 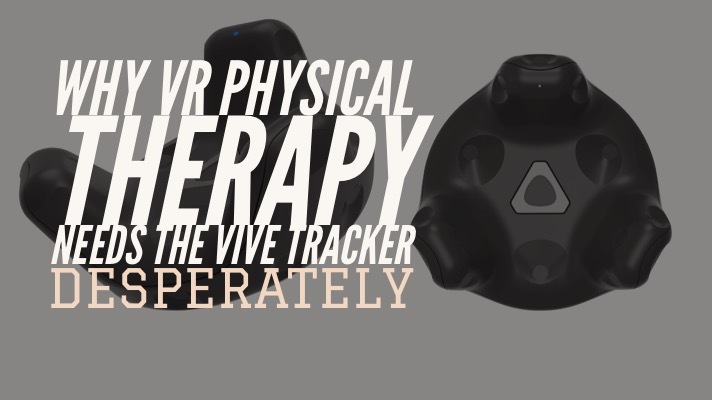 With the ability to bring any element with us into VR, all the tools we use in physical therapy can become available. Resistance bands, weights, you name it. Now we can start adding resistance to the training and take things to a whole other level. Although we will probably not use these tools in their traditional form. We are more likely to see dumbells transformed into fireballs, pull-up bars into branches we can climb and much more. Again, its up to the creativity of the content creators to help this concept succeed . But seeing as other startups are already working on fitness games in VR, we are sure to see this trickle down into physical therapy as well. More interesting is that we will see the ability to track more parts of the body. This is by far what im most excited for. This will mean that we can start making games that do not exclusively target the head or arms. Adding a tracker to each foot we let us track the feet. Now we can start training the knees (this one is a biggie for physical therapists). Add another one on you lower back and you can start properly training the back. The possibilities are endless and it only stops with the developers. So PT’s out there get excited. Thats it for this time. I do hope you enjoy my rants. If you do, please share and leave a like. If you would like to see the VR physical therapy software we are developing you can follow us here. Physical therapist and VR developer.